After five years and 1.2 billion dollars, Disney California Adventure (DCA) re-launched itself last week, and it didn't disappoint. The take away from the Disney Marketing folks is, "The happiest place on Earth just got happier!" If you loved Disneyland and DCA before, come back for more. If you thought there wasn't enough for an extended visit, give it another try. There is more, more, more and better. Before Disney's Grand Californian Resort and Spa, there was only one queen, the Disneyland Hotel. For a while there, she played second fiddle. Now, you have a debate: which is better? Disney's Grand Californian or the Disneyland Hotel? While The Grand has added a few Disney Vacation Club accommodations, it’s pretty much stayed the same over the last few years. The Disneyland Hotel on the other hand has been gutted and brought back to life. She was torn down to the studs: new wire, new drywall, new windows, new courtyard, new pools, new dining... She also has four "Signature" suites with another one on the way. The one pictured above is the Adventureland Suite. Here are some things to know: The suite faces the pool, not the Downtown Disney/fireworks view. The three hotel towers have been renamed Frontierland Tower, Adventureland Tower, and Fantasyland Tower. Because there are suites in each of the towers, including the Adventureland Tower, when asking for one of the spiffily-themed rooms, you need to get the cast member's attention by saying, "Signature Suite." Otherwise, you could get a standard suite in the Adventureland Tower. One clue if you have the right room is the price, running from $3,500 to around $4,600 including taxes, per night. One of the perks of the Signatures Suites is they do automatically come with Concierge amenities. At the Disneyland Hotel, concierge is considered an added service, not a room category. Any room can have concierge service added, so don't assume a suite comes with club-level access and amenities. It doesn’t. Concierge service also can't be guaranteed until time of check-in. The Concierge Lounge at the Disneyland Hotel does have brilliant views of the Disneyland fireworks, along with a bevy of snacks. It is a great choice for a family with younger children who don't think they can stay out of their pajamas all the way until fireworks time, especially in the summer with its longer park hours. Disneyland Hotel has just recently been named a four-diamond hotel by AAA. Now she shares the same rank as The Grand Californian. Rooms and the pool area at Disney’s Paradise Pier Hotel have also been candy-coated, although not to the same extent as next door. Even with the new spiff-up, this hotel is still a step below Disney's two other on-property hotels, at three diamonds. 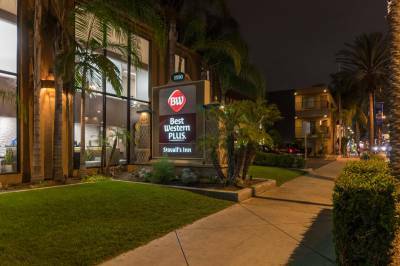 This is the most affordable of the three on-property hotels, but still more expensive than most Good Neighbor hotels. The reason to stay here is the World of Color view. Ask for a "premium, theme-park" view. For those without a theme park-view room, you can see parts of the Disneyland fireworks and the World of Color spectacular by standing just off the elevator lobby on the top floor. It's not ideal, but it’s will get you by if your feet just can’t carry you one more mile in the parks. Fun fact: Walt Disney World will have 29,000 on-property rooms once Art of Animation is complete. Disneyland has only 2,400 rooms available in its three hotels. That's just a little more than at WDW's Caribbean Beach Resort. OMGOMGOMG! The first Starbuck's is open in a Disney park! The line on opening day literally went out the door, from park opening until about noon. The only lines longer were in Cars Land. In Disney-speak, the Starbuck's is sold out of the Fiddler, Fifer, and Practical Cafe, or just "Fiddler" as the locals are calling it. It has all your coffee favorites, along with an expanded food menu of soups, salads, and sandwiches. 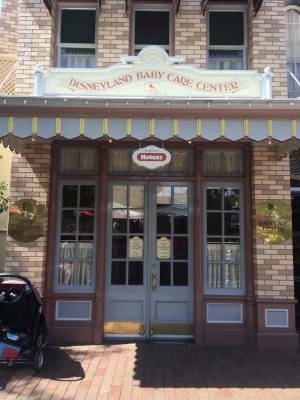 It shares a large indoor seating area that also supports Clarabelle's Ice Cream and the sweets shop. Of great excitement are the new Carthay Circle Restaurant and its first floor Lounge. Chef Andrew Sutton of Napa Rose has crafted his own style of magic again at this new venue dedicated to “Southern Californian modern cuisine, wine, and cocktails”. There is outside patio dining on the second floor, but to get the full effect, reserve indoor dining. Of all the food I consumed last week, Sutton’s espresso mousse in a shot glass was my favorite. And the real reason we’re here…. Cars Land! While we knew tons about what to expect from the attractions at Cars Land, many people may have misconceptions about it. I was speaking with a friend from Southern California who assumed because her son was five when the movie came out, that Cars Land must be geared to very young children. And in looking at how “a bug’s land” is geared, she may have just assumed more of the same. So let’s set the record straight. One of the key, overarching themes to the re-launch of DCA is to make the park more user-friendly for all ages. They are trying to appeal to a wider set of ages, genders and interests. Thus, all three Cars Land attractions are geared towards a very broad audience. 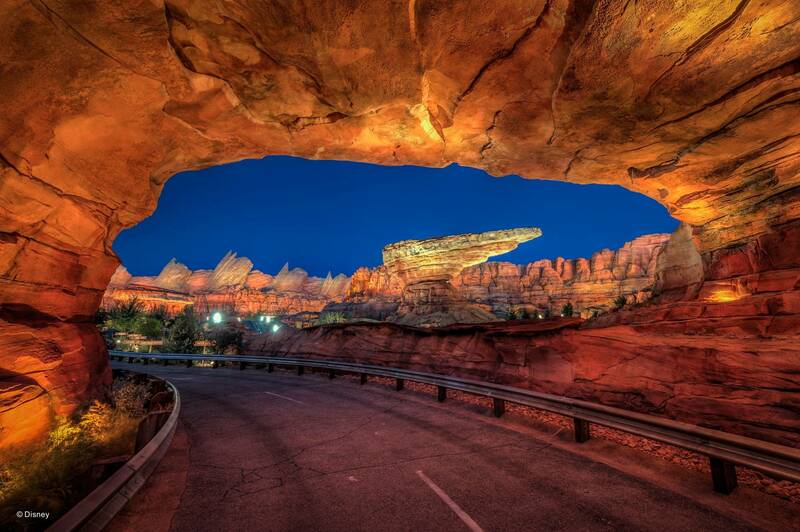 Even Radiator Springs Racers, which is the star thrill attraction, has a minimum height restriction of only 40 inches. That’s two inches lower than Goofy’s Sky School, the newly re-themed “kiddie coaster” at Paradise Pier. 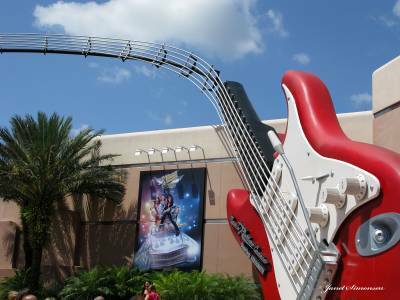 Disney is very consciously trying to make entertaining attractions and experiences for the whole family at the new DCA. Disney's other strategic goal is to get guests to consider DCA a full-day park. You have seen this with the addition of World of Color; now guests have a reason to stay in the park into the evening. 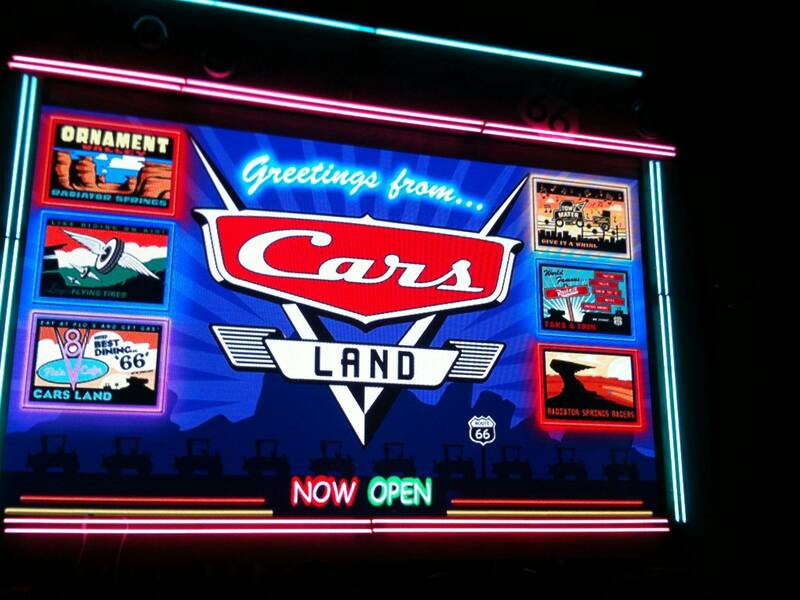 Cars Land adds to this by showing off its neon on Route 66 and the full lighting of Ornament Valley. Guests will be able to enjoy this area day or night. Another evening offering is the new Mad T Party, taking over from elecTRONica in Hollywood Land. This is not Walt’s animated fantasy; this is Johnny Depp once again making a modern stamp on a Disney park. With cross-generational beckoning, this area will keep tweens, teens and twenty-somethings bopping around while their parents can grab something stout at the “Drink Me” stations. Bring earplugs; it’s loud. In the dark, it has enough neon to rival Route 66. • Ghirardelli’s Soda Fountain and Chocolate Shop is now open and giving out samples! • Matterhorn Bobsleds are back on track! As you can see, all the “Under refurbishment for your enjoyment” signs have been put back in storage. Everything is open and ready to bring a smile to the guests. The time we’ve all been waiting for at Disneyland is here at hand. While Cars Land and Fiddler’s will be packed for quite some time, the rest of DCA remains quite manageable. In the last few days, people have even commented on how reasonable the summer crowds are next door at Disneyland. 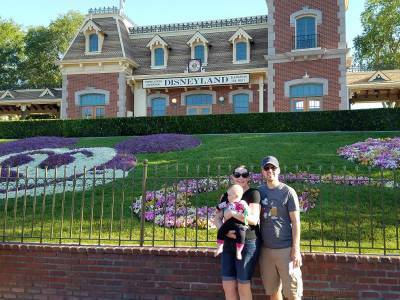 If you haven’t been to the Disneyland Resort during the summer, now is the time! About the Author: Mary Wotherspoon is a Travel Planner affiliated with MEI & Mouse Fan Travel. 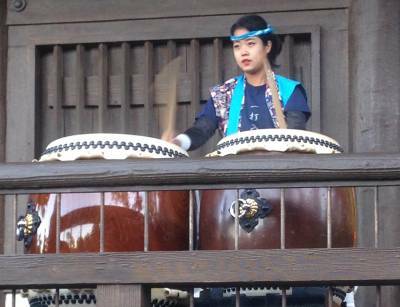 Want to know more about Disneyland Resort? Sign up to get our free weekly newsletter with the latest news and updates on Disneyland Resort and a 20% discount coupon.